We provide a 9-year warranty on Deep Blue's battery capacity. * Adherence to warranty conditions required. See Deep Blue battery capacity warranty at service@torqeedo.com for more details. Outboard with tiller: Outboard with tiller for steering and throttle, available as 40- or 80-HP equivalents, various shaft lengths. Models: Deep Blue 40 TL/TXL and Deep Blue 80 TL/TXL. 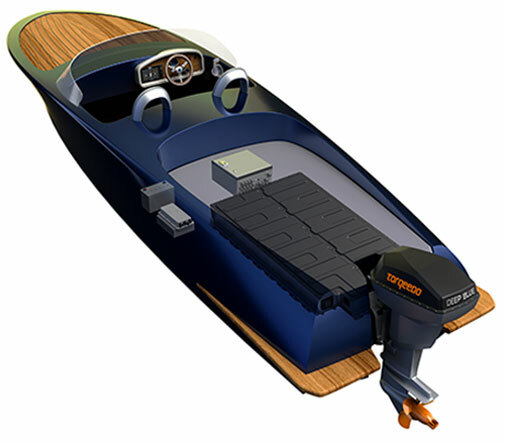 Inboard: Inboard with drive shaft, available as 40- or 80-HP equivalents, various motor speeds. Models: Deep Blue 40 i 1400 / 1800 and Deep Blue 80 i 1400 / 1800.